GET A FREE LISTING ON OUR SITE! "Prompt in responding to any questions, JSBM (our parent company) has made a difference in my client referrals. I like the informality in working with Brad who responds to my requests even on vacation!" - Dr. Janan B. "Brad has been very helpful in providing important information regarding how to grow a counseling practice in today's world of the internet." - Jan H.
Guaranteed Referrals: We will ensure you get minimum referrals to your page each month depending on your program. Why there usually isn't a 1-referral to page to guaranteed client, enough referrals generate business. Keep in mind that many people will call you directly from your landing page because they don't want to have their e-mail on record. 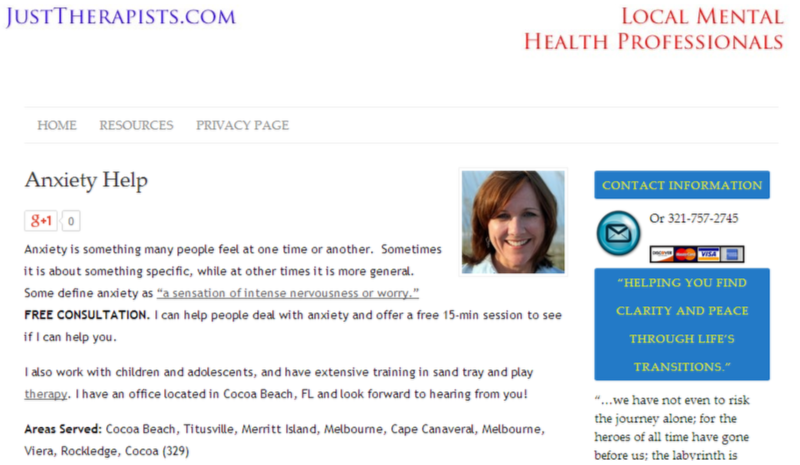 Limits to Competitors: Go on some of the larger sites like PsychologyToday and you could be one of 100's or 1,000's. Those numbers overwhelm people looking for mental health. By keeping ourselves limited, we focus the attention on you. Once we have PAID subscriptions that are 10% of those listed on PsychToday's website for a city, we will offer those with a FREE listing a one-time opportunity to join as a paid member. After that, the FREE listing will be deleted. We only have 1 Premium Client per 20 listings per city. These clients are interested in really taking their practices to the next level and get one-on-one help from a professional marketing and public relations pro with 20+ years experience.